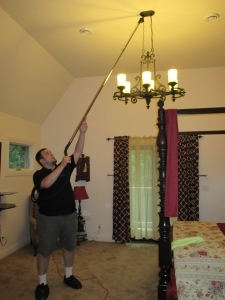 The perfect home cleaning is one that is perfectly customized to meet your needs. After all, it is your home that we are cleaning and not ours, and we want to make it our top priority to clean your home the way YOU want it done and not the other way around. That is why we take great care to make sure we customize each cleaning to meet the expectations of every one of our customers. Besides illustrating just how versatile we are as a company, making this commitment shows just how much we care about the families we service. SO HOW MUCH DO WE CARE? So that prospective customers can understand the full scope and value of our services, I have written a list of the little things that we do that have labeled us, in the words of one of our customers, the piece de resistance of home cleaning. Please Note: the services listed below represent only a small fraction of the requests we have received from our customers over the years. If there is particular service need, related to home cleaning, that is not listed below do not hesitate to ask. No reasonable request is ever refused. Scheduling to fill a need- If you hate taking your garbage to the curb, schedule your cleaning on trash day and save yourself the hassle. This especially works well for our elderly customers that absolutely love this service. Protecting your investment- Just put in a new wood floor? Have us maintain and protect it with regular cleanings. Very few companies know how to take care of a wood floor without wrecking the finish. Dogs will not shed in heaven- Regular cleanings will greatly cut down on the amount of hair you have to deal with on a daily basis. Our customers like the fact that we vacuum the pet hair that lurks underneath the couch cushions and furniture. Taking the time to disinfect- While any cleaning company can be fast, we know when to slow it down. For example, very few companies take the time to disinfect surfaces correctly. Quick Fact: Depending on the disinfectant, some products require surfaces to remain wet for up to 10 minutes to kill 99.9% of germs. Next time you are in the store read the fine print on the back of disinfectants. We follow hospital grade guidelines when it comes to killing germs.